Adolescents and youth have a right to education and skills-building as they experience physical and emotional maturation; begin relationships; and face decisions that will affect their lifelong physical and mental health and well-being. Yet research shows that the majority of adolescents lack the skills and knowledge required to make those decisions responsibly, leaving them vulnerable to coercion, sexually transmitted infections (STIs), and unintended pregnancy. Comprehensive sexuality education enables young people to make informed decisions about their sexuality and health. It is taught over several years, introducing age-appropriate, scientifically accurate information consistent with the evolving capacities of young people. And it goes beyond information, to encourage confidence and improved communication skills. These programmes build life skills and increase responsible behaviours, and because they are based on human-rights principles, they help advance human rights, gender equality, and the empowerment of young people. 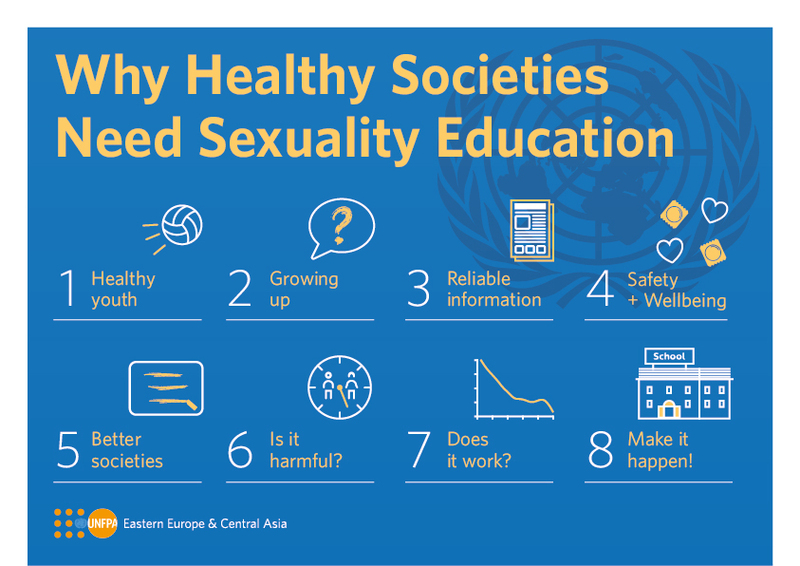 While sexuality education exists in most countries, in the Eastern Europe and Central Asia region, it tends to be limited and too often perpetuates cultural biases and stereotypes rather than promoting human rights and gender equality. UNFPA supports efforts by countries in this region to deliver comprehensive sexuality education with a particular focus on ensuring that curricula meet international standards and on training educators who promote respect for gender equality and the rights of adolescents and youth to have control over matters related to their sexuality, including their sexual and reproductive health. Outside of schools, UNFPA works with the established Youth Peer Education Network (Y-PEER) and utilises innovative tactics – including websites and social media, theatre performances and celebrity spokespeople – to reach the young people most in need of information with quality facts and messages about sexual and reproductive health. Numerous studies show that curricula providing accurate information about condoms and contraception can lead to reductions in the risky behaviours reported by young people, particularly when gender equality is integrated into the learning material. Young people who adopt egalitarian attitudes about gender roles have been found to be more likely to delay sexual initiation, use condoms, and practice contraception. They also have lower rates of STIs, including HIV, and unintended pregnancy, and they are less likely to be in violent relationships. By emphasising rights and gender issues, comprehensive sexuality education programmes help reduce gender-based violence and bullying, promote safe schools, empower young people to advocate for their own rights, and advance gender equality. Why Should Sexuality Education be Delivered in School-Based Settings?